Jeep, a name virtually synonymous with SUVs for more than three-quarters of a century, has hit the mother lode in recent years as buyers suddenly began flocking to that market. And in the hottest segment of that market – compact SUVs – the company has long had three entries, together accounting for half of its entire model portfolio. So it may seem a bit odd that Jeep has chosen to reduce its compact-SUV offerings, with the former 2017 Compass and Patriot being replaced by a completely redesigned (drumroll, please) … 2017 Compass. 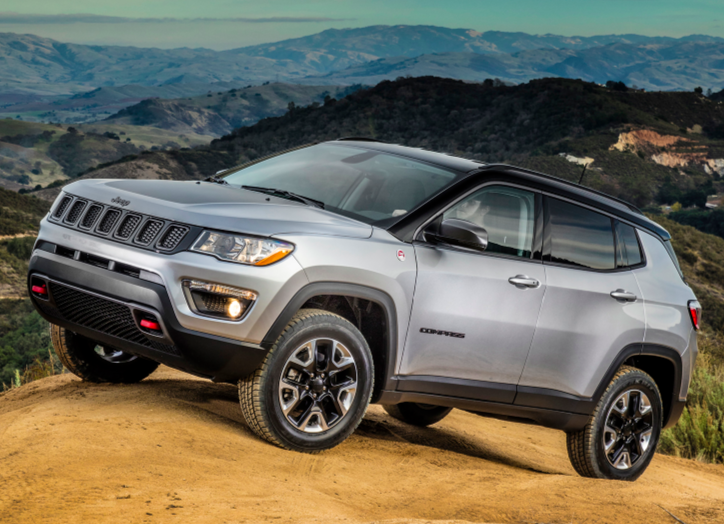 The Compass model lineup includes the off-road-oriented Trailhawk, which features a raised suspension, low-range gearing, skid plates, tow hooks, and “tucked-in” front and rear fascias that allow for steeper approach and departure angles. That’s not a typo. For while it may be confusing to folks – particularly down the road when they both become used cars – the new Compass carries the same 2017 model-year designation as the outgoing model. But besides the one returning engine and a couple of transmissions, that’s among the few things that are carried over. 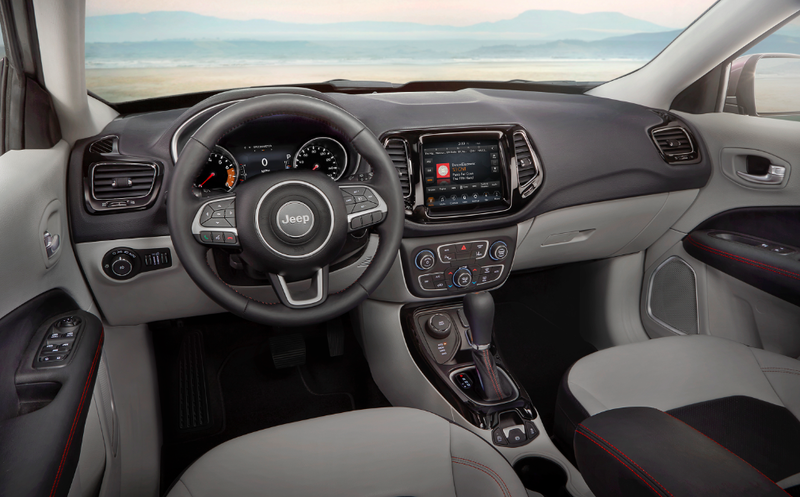 The new Compass sits on the “Small, wide, 4×4 platform” introduced for 2015 by its subcompact-SUV sibling, the Renegade (and also used for the Fiat 500X). However, the platform has been stretched a few inches to give the new Compass more interior and cargo room. Still, as compact SUVs go, the Compass is on the small side. At 175 inches stem-to-stern, it’s nearly identical in length to the previous Compass (and about two inches longer than the Patriot), which straddled the line between subcompact and compact SUVs. As many competing SUVs have grown a bit with each new generation, that may seem like a strange strategy. 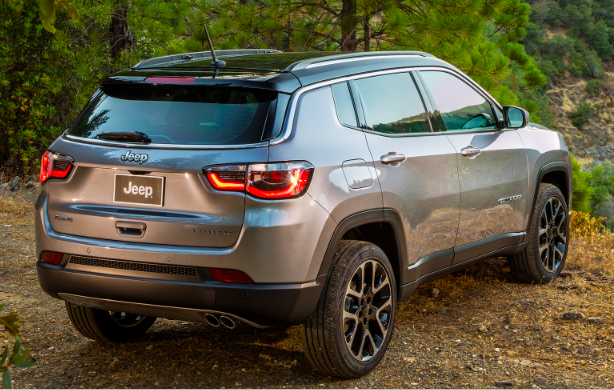 But with Jeep’s other compact SUV – the Cherokee – sitting at the larger end of the class, the Compass slots almost perfectly between the Renegade and Cherokee in size. While the old Compass could be had with either a 2.0- or 2.4-liter engine, the new Compass comes only with the 2.4, now rated at 180 horsepower and 175 lb-ft of torque — both up a bit from before. A 6-speed manual transmission and 6-speed automatic remain available, but the formerly offered CVT automatic transmission has been replaced by a 9-speed automatic. The manual is available on both front and 4WD versions, with the 6-speed automatic being offered with front-wheel drive, the 9-speed with 4WD. A start/stop system designed to save fuel in urban driving is standard with either automatic transmission. On front-drive models, EPA ratings are 23 city/32 highway with the 6-speed manual, 22/31 with the 6-speed automatic. With AWD, they’re 22/31 with the manual, 22/30 with the 9-speed automatic. Trim levels ascend through Sport, Latitude, and Limited offerings, with a Trailhawk slotted in as a more serious off-road model. It features a bit more ground clearance (8.5 inches vs. 8.2 on other 4WD models), along with off-road suspension and tires, front and rear skid plates, tow hooks, special bumpers that allow for steeper approach and departure angles, and low-range gearing providing a 20:1 crawl ratio. Whereas other 4WD models come with Jeep’s Selec-Terrain system offering Auto, Snow, Sand, and Mud settings, the Trailhawk’s adds a Rock setting with Hill Descent Control. Trailhawk is the only Compass that’s “Trail Rated,” Jeep’s stamp of serious off-road capability. Compass comes only with a 180-horsepower 2.4-liter engine, but offers a choice of manual or automatic transmission in both front- and 4-wheel-drive versions. Prices start at just over $22,000 (including destination) for a base front-drive Sport with manual, and max out at about $35K for a loaded 4WD Limited. Part of being “off-road capable” means having a stiff body structure, an element of which might be the requirement for thicker roof pillars. If so, that would explain one of the Compass’s few negatives: somewhat restricted visibility. While the Compass indeed felt very solid – even over the rather torturous roads and trails we traversed – its thick roof pillars blocked a lot of the view to the front corners, sides, and rear corners (something that can also be said for the old Compass/Patriot, as well as the current Renegade and Cherokee). Fortunately, a standard rearview camera helps when backing, and at least the one fitted to the tested Limited showed a 180-degree view on its accompanying large, 8.4-inch dashboard screen. For all its off-road prowess, the Compass rides quite comfortably in less-demanding driving, and it also handles well. Its 36.3-foot turning radius is fairly tight for the class – and the Trailhawk’s 35.3 feet is even better — aiding maneuverability both off-road and on. Meanwhile, the powertrain is a mix of good and … not so good. The engine is no powerhouse, but at least with the 9-speed automatic in our tested Limited, it provides a decent full-throttle jump off the line and linear – if not particularly strong – acceleration, making no undue noise in doing so. It’s also fairly quiet at idle and under cruise conditions, and the start/stop system (standard with automatic transmission) is fairly unobtrusive in operation. The problem comes when trying to gain speed for passing. With the 9-speed automatic – which is fitted to all 4WD models that don’t have the 6-speed manual – there’s often a long delay after flooring the throttle before the transmission downshifts to a lower gear for more power. This is something we’ve noticed in other Chrysler/Dodge/Jeep vehicles fitted with this transmission, so it comes as no big surprise. The Trailhawk carries Jeep’s “Trail Rated” credentials, and it probably boasts far greater off-road capability than most buyers would ever have the nerve to test. Although most owners will probably never come close to maxing out the off-road limits of any 4WD Compass, a rough-trail excursion in a string of Trailhawks really showcased what “Trail Rated” means. Through mud and over rocks, hills, and wildly undulating surfaces, we went places we only ventured because the vehicle in front of us had already made it through. 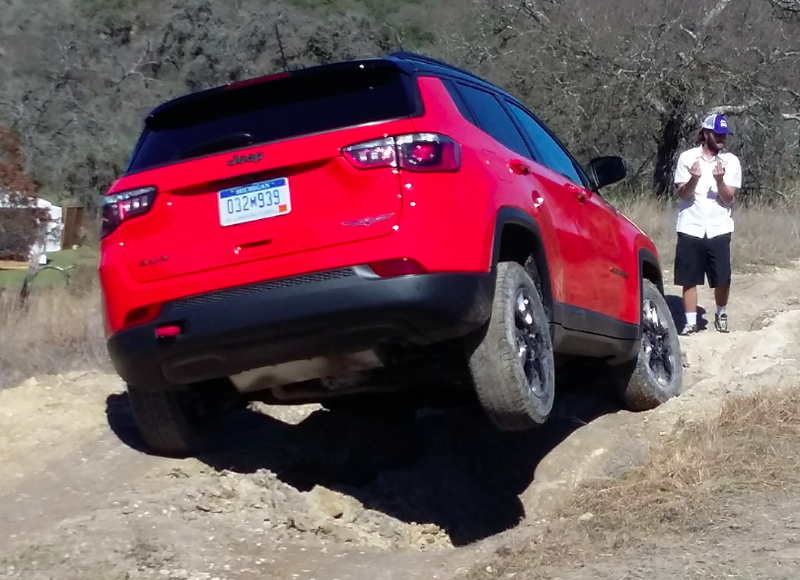 Jeep says the Compass has “class-leading off-road capability,” and nothing in this demonstration made us question that claim. Inside, there’s sufficient headroom and legroom both front and rear to comfortably accommodate four full-size adults. The biggest limitation of our sunroof-equipped Limited was in rear-seat headroom, which was “only” sufficient for those up to about 6-feet tall; part of that was due to the comfortably high seat cushion (adults don’t ride “knees up”), and part to intrusion of the sunroof’s housing dipping below the level of the ceiling. Ingress and egress are a snap. The interior is well laid out, nicely appointed, and offered in two-tone color schemes, but thick roof pillars hurt visibility some. Many cabin surfaces are padded, and all-black or two-tone color combinations are offered. The overall look is more businesslike than flashy, but it’s certainly appropriate to the price. A large glovebox and medium-size console box are augmented by numerous small storage cubbies, making for decent stash space. Audio and climate controls are within easy reach and are fairly easy to use, though the climate controls – at least on the tested Limited – consisted largely of rather tedious repetitive-step pushbuttons for adjustments, with some being relegated to the touchscreen. There’s about a one-inch drop to the folded rear seat backs, but that doesn’t impede the ability to easily slide long items forward. The front passenger seat folds flat to extend the cargo area even farther, and there’s also some hidden space beneath the cargo floor. A power liftgate is available on all but the base Sport. 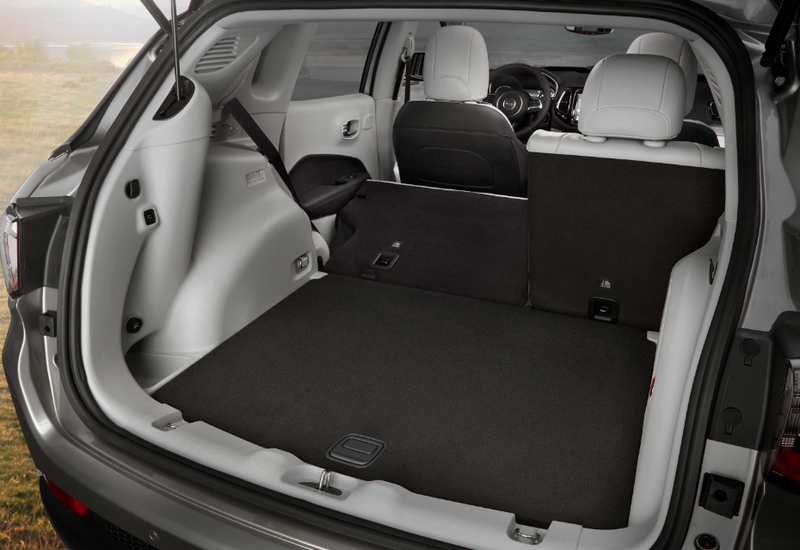 In back, the cargo area is wide at the rear and fairly sizable, offering 27.2 cubic feet of space behind the rear seat, and 59.8 cu. ft. with the rear seat back folded. That folded seat back doesn’t lay quite flat and it rests about one inch below the level of the cargo floor, but that’s far better than resting one inch above, as there’s no problem sliding long items forward. Speaking of long items, the Compass also has a fold-flat front passenger seat that allows for really long items to be carried. There are also a few tie-down hooks in back, along with some hidden storage space under the cargo floor. When it goes on sale in March, the Compass will be offered in four trim levels: entry-level Sport, mid-level Latitude, off-road-oriented Trailhawk, and luxury Limited. Sport and Latitude can be had with either front-wheel drive or 4WD; Trailhawk and Limited come standard with 4WD. Unlike the “old” Compass and Patriot, the new Compass comes fairly well equipped in base form, and even the Sport can be fitted with a fair number of desirable options. Furthermore, several high-tech features are available that previously were not. 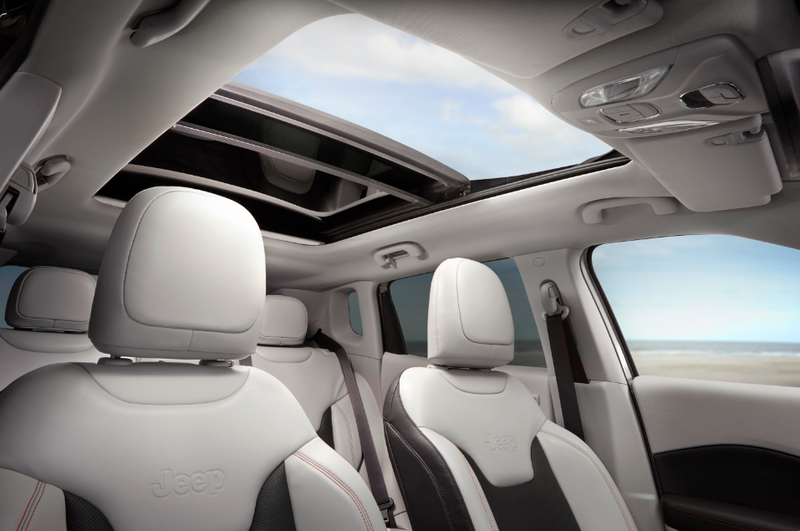 Optional on all but the base Sport is a large, dual-pane panoramic sunroof. Starting at $22,090 including the $1095 destination charge, the front-drive Sport comes standard with the 6-speed manual transmission, air conditioning, power windows/locks/heated mirrors, cruise control, keyless entry, pushbutton start, 5-inch touchscreen, Bluetooth, voice text reply, a rearview camera, and 16-inch steel wheels. Options include roof rails, heated steering wheel and front seats, satellite radio, rear-obstacle detection, 16-inch aluminum wheels, and a reversible carpet/vinyl rear cargo mat. The 4WD version adds $1500, starting at $23,590. Front-wheel-drive Latitudes come standard with the 6-speed automatic, while 4WD versions come with the 6-speed manual; as such, both share the same $25,390 starting price. They add keyless access, automatic headlights, cornering/fog lights, roof rails, and 17-inch aluminum wheels. Latitude also offers a wider choice of options that include a power liftgate, dual-pane sunroof, 7- or 8.5-inch touchscreen, navigation system, Uconnect Guardian assistance system, rain-sensing wipers, power driver seat with 4-way power lumbar adjustment, blind-spot and rear cross-traffic alert, forward collision warning and mitigation, lane-departure warning and mitigation, satellite radio with SiriusXM Traffic and Travel Link, Apple CarPlay/Android Auto, and a 115-volt power outlet. Trailhawk ($29,960) comes only with 4WD and adds the previously mentioned off-road items, plus the 9-speed automatic transmission, full-size spare tire (vs. an inflator kit or optional compact or full-size temporary spare on other models), red interior accents, 115-volt power outlet, 8.5-inch touchscreen, satellite radio, and Apple CarPlay/Android Auto. The $30,090 Limited also comes only with 4WD and adds 18-inch aluminum wheels, leather upholstery, dual-zone climate control, heated steering wheel and front seats, wiper de-icers, power driver seat with 4-way lumbar adjustment, auto-dimming rearview mirror, and remote start, and is the only model to offer optional 19-inch wheels. In the whole scheme of things, both Jeep and its buyers did well in this two-for-one trade. The new Compass is decidedly more modern than the one it replaces, seems to be better equipped for the money, and is available with a contemporary list of high-tech features its predecessor was sorely lacking. Although it’s not without faults, it’s now a competitive entry in this hotly competitive class, and scores additional points simply by having the legendary Jeep nameplate on its hood. 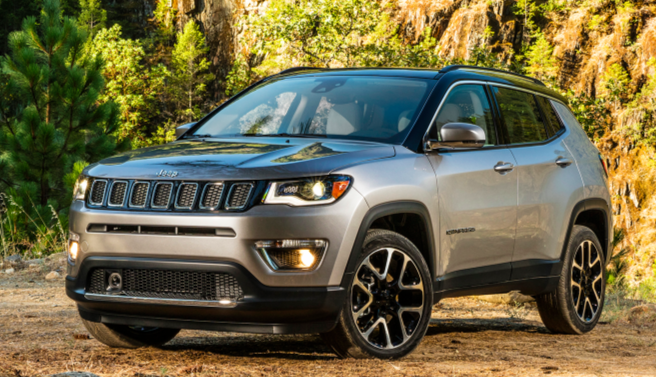 Compass is on the small side for a compact SUV, leaving the larger end of the scale to its bigger Cherokee brother. Nonetheless, it’s roomy enough for four adults and has a decent amount of cargo space. It also offers numerous high-tech features along with a pricing structure that may well make it the bargain of the entire Jeep lineup. Written by: Rick Cotta on February 24, 2017.on March 22, 2019.